I love my bed, but some nights I just can’t sleep. Especially with the muggy weather at the moment, I am constantly checking my Fitbit and the other week I only managed 5 hours sleep in a night. It said I was awake for 1hr 41 minutes! 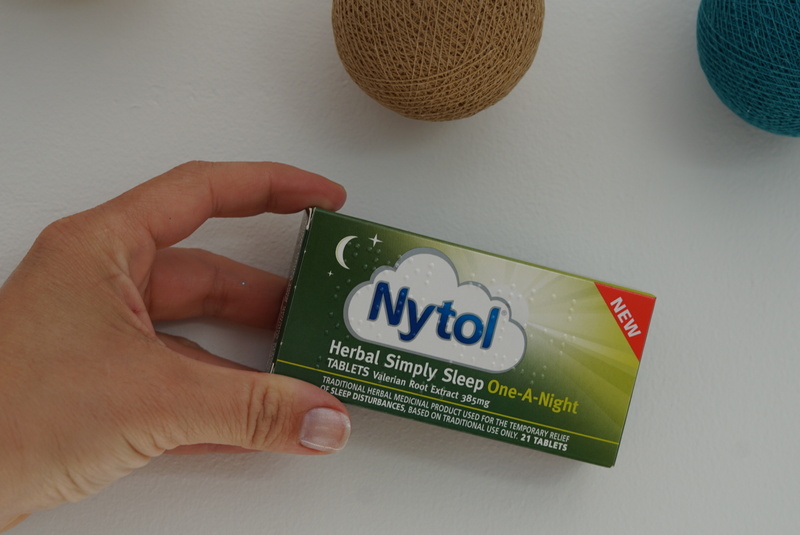 I was so relieved when Nytol sent me a goody pack to help me get a better nights sleep by fixing my bedtime routine. It included vouchers to grab the new Nytol Herbal Simply Sleep One-a-Night tablets which you can take 30 minutes before bedtime. If I have a bad nights sleep, it will be the day after that I feel dreadful. (Not great news for tomorrow!) Nytol recently carried out a survey and 50% of people said they do not get enough sleep. I really wish I had 8 hours every night, but the truth is on average I get less than 6 hours. It’s horrible. With all of this in mind, Nytol have created the “Holy Grail” for the perfect bedtime routine with the help of Dr Neil Stanley and Mark Cropley. After just 5 nights you can feel the difference, give it a try. 30 minutes before bedtime – start to get in the mindset for bed. Send that last email. Check that Instagram account one last time. Upload that final Insta Story of the day! Get it off your chest and out of your mind. If you have multiple things to do, make a quick list for tomorrow so that you can release it from your worries. Apparently people that write to do lists before they go to bed are more likely to sleep better. Better still, keep a list pad by your bed! 25 minutes before bedtime – Reduce the blue light! Blue light is known to suppress the release of melatonin, which tells your body it is time for bed. Using screens before bedtime will therefore not help you prepare for sleep. Turn off the computer, tablet and phone. I have started turning my phone completely off. It feels really good. I turn it off and it doesn’t come back on until 7am. The recommendation is to not endure light that is more powerful than a lightbulb when you are this close to bedtime. 20 minutes before bedtime – brush your teeth and follow your teeth cleaning routine, take the make up off and feel lovely and clean. Doing this a little before bedtime will help because you do not feel quite so alert when you do go to bed. Your body will also learn that this means it’s bedtime soon. 15 minutes before bedtime – Have a 5 minute hot shower. It is not only relaxing but heating your body can actually help to cool it down. In order to get a good nights sleep your body needs to lose about 1 degree of it’s body temperature. Give it a try and see if it makes a difference. Some nights I have a hot bath before bed, so I do that half hour before bedtime. 10 minutes before bedtime – Finish off everything before you get in to bed. Check on the kids. Make sure the dogs have had a wee. Go for a wee! All those things that you know you will remember once you’ve settled down and then have to get out of bed for. 5 minutes before bedtime – get into bed and say goodnight. Don’t scroll through your phone. Do not chat about your day with your husband. Get comfortable. Let go of the day and go to sleep. As part of the bundle I received, Nytol sent me a new alarm clock. The LifeBee alarm clock is a really great way to wake up. It lights up half an hour before my alarm time and the alarm can be a range of sounds, I have set it to the seaside sound. It’s lovely waking up to the sound of the sea and seagulls. The clock has a setting on it that changes through a variety of different coloured lights too, I have this on in the evenings as it is really relaxing. It goes through blue, purple, pink, yellow, orange and green. It’s really therapeutic. I would definitely recommend this alarm clock. Night then! If you have any fabulous bedtime routine tips I would love to hear them in the comments below or on social media using @mummyconstant and use the hashtag #SayGoodNytol.